We have over 100 different Motorsport, sports and classic seats available in our showroom for viewing and testing. We also have an extensive range of HANS Device, racing harnesses, racewear and safety equipment! We will be happy to help ensure you pick the right seats and equipment for your requirements and specifications from all the big brands including Cobra and Corbeau to Sparco and OMP . This Motorsport competition package we have available gives you a fantastic saving all 2 seats, 2 mounts and 2 harnesses. This gives you all the key equipment you need to set up your seating position and get you ready to race. The Sabelt GT-090 is an amble sized seat suitable for all sizes of people while offering great deep seated support and FIA approval for all forms of Motorsport. We now have an extensive range of race-wear, suits, boots, gloves, helmets, accessories, intercom systems and much more available on our main GSM Performance website. Click the link below to gain access to hundreds of exciting new items or of course visit us in-store to try on the right race-wear for you. Contact us about finance today! Refer a friend and receive £20.00! Simply refer a friend to our store and receive a £20.00 gift voucher that can be used on any of our websites. On checkout they just need to provide your name and email address for us to have your digital gift voucher emailed over the same day. Discounts the GSM way! Why choose GSM Sport Seats? We are a family run business who value every customer. When you choose to buy from us we personally track your order from start to finish with no automated systems. We also support the UK manufacturing industry, local automotive businesses and tuning garages. Buy now with peace of mind. We now have the UK's first in-store Pro-Fit zone where we can customize any of the Cobra Motorsport seats including the popular Cobra Suzuka and Cobra Imola to ensure the highest levels of comfort and support for you. Contact us to book your appointment today so we can get you prepared to race! Not only do we have a huge selection of retro and classic seats to try in-store from world famouns brands including Corbeau and Cobra but we also have one of the largest selections available on-line. Available in vinyl, cloth, cord, and bespoke trims we will have the right classic seat for your pride and joy. We do not only bring you the very best in Automotive racing seats, rally seats and Motorsport seats but we can combine them with our extensive range of HANS Devices from all the leading brands including Stand21, Schroth and Simpson. Contact us today or click the image below for the full range we have available. This e-store is part of GSM Performance. We are a family run company based in Nottinghamshire and are Europe's only specialist in car seats, racing seats, sport seats, bucket seats, rally seats, classic seats, retro seats, motorsport seats, HANS devices, roll cages, office sport seats and racing harnesses. We research the market weekly to provide the most accurate information and latest seats like the world famous Recaro Sportster CS recliner to the impressive Sparco Evo 2 Motorsport seat. With our extensive product database and vast car fitting frame application lists we are sure we can find you a seat to match your criteria. We now even supply seats and harnesses which fit perfectly into a range of kit cars including the Panther Kallista and Caterham 7. What brands do we supply? It may be easier to ask what brands do we not supply! After being established in 2003 and specializing in sport seats from 2007, we have built up a large supplier network including all of the world's major brands including Border, Bimarco, Buddy Club, Cobra, Corbeau, Exo, FK Automotive, Konig, Luke, Mamba, Motordrive, Momo, OMP, Reverie, Recaro, Sabelt, Schroth, Sparco, TRS and more. We sell high quality steel frame, fibreglass, kevlar, carbon-fibre and twin skin carbon-fibre racing seats and racing harnesses at fantastic prices. We are proud to bring the next generation in rally and racing designed office seating to market. Our high quality photos allow us to show you in detail exactly what you will be receiving and our customizable trims, fabrics, stitching and logo designs allow us to provide the seats to your exact specification. Whether it be for the home office, work office or public waiting areas, we can assure you these are a great purchase over standard office seating. If you need bespoke seats made to your exact specifications then its not a problem at all. We have a wide range of trim samples in-store, we can discuss fabrics, trims, colours and patterns and custom logos or brands which can be added to a range of our products. We have already supplied seats to NIKE, Partick Thistle FC, The Gadget Show, Mclaren and many more high profile customers. When you need a quality product with exacting personal customer service then we really are your only choice. Now making our service even better you can find us in-store! Our GSM Performance show room has over 60 models of sport seats, 10 types of harnesses, 7 large brake kits, 2 racing simulators and much more. You can try out all our products and set your self a lap time on the Top Gear test track so contact us today, book an appointment and come along and visit us in-store today so you can see what we can do for you. With our experience in the market and a product range un-rivalled by anyone in the UK we should be your number 1 stop. Looking for a new set-up for your rally or race car and want a great deal? 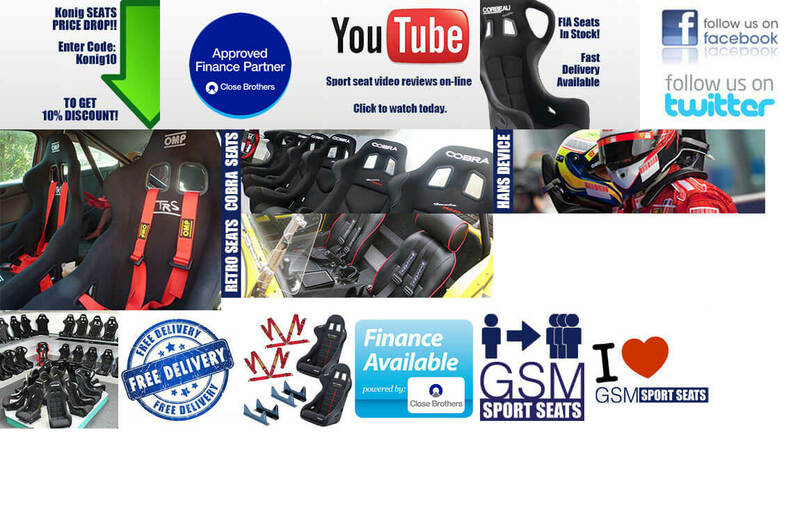 We have a wide selection of popular Motorsport packages available which include seats, harnesses and side mounts. We have deals from all the big brands including Sparco, OMP, Corbeau, Cobra, TRS, Mirco and many more. Click the image below to take a look at what we have to offer and grab your deal today! This Planted Seat Spacer is 1/4 inch thick aluminum powder coated black, and is th.. Planted Technology sub frames are made to fit Sparco, Cobra, Corbeau and Recaro seat..
Information: Recaro sub frames are made to fit Recaro seats directly into your .. The Sparco QRT Performance seat is new for the Sparco range in 2019. It was designed..
PCI Racing Mazda MX5 Mk3 seat mounts provide a perfect installation with our wide ra.. The Sparco Grid QRT is a relatively new seat for the Sparco line up. This great look.. The Sparco Circuit II QRT Motorsport Bucket seat has been redesigned for 2019. It is.. The Sparco Circuit QRT Motorsport Bucket seat has been redesigned for 2019. It is no.. The Sparco Evo II QRT Motorsport seat. This is the latest iteration of one of Sparco.. The Sparco Evo QRT Motorsport seat. This is the latest iteration of one of Sparco..
Sparco QRT-R Vinyl Fibreglass FIA Bucket Seat. The Quick Resin Technology (QRT), inv..